THE SKINNY: I am an eye liner junkie. It is probably the one beauty product I can't live without. The number of pencils and gels on my counter-top is borderline embarrassing. 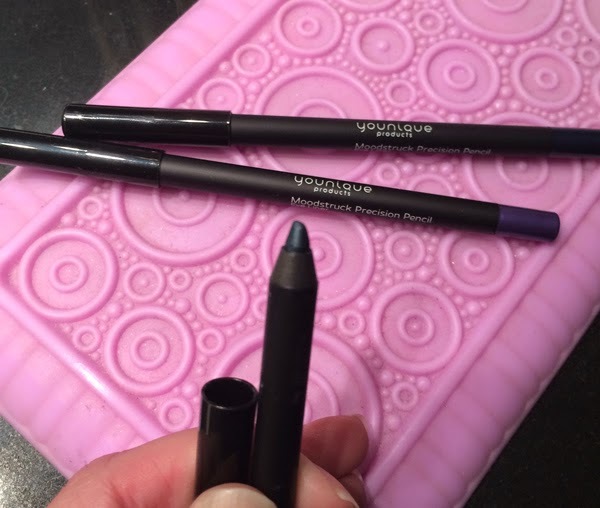 So when I saw the Younique Moodstruck Precision Pencil Eye Liner, I bought three more. And I was not disappointed. These pencils have great color that glides on so smoothly. The color is exactly as it looks on the bottoms of each pencil and stays ALL DAY LONG with a primer. I absolutely love the green-blue (Presumptuous). The liners help me get my go-to look -- a pop of liner for color and neutral shadow. This is one of the best liners (and even items) I have ever tried. CHECK IT OUT: These great pencils come in 10 colors. Please support my girl Frances by ordering from her page if you want to buy these.